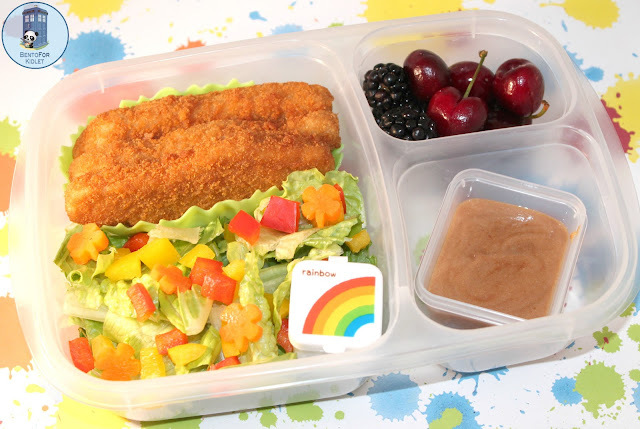 Bento for Kidlet: Tasty Lunch and a Country Bob's Giveaway! Today was a quick lunch kind of day! Kidlet chose all of the things to go in to his box and I tossed it together :) Teamwork! Kidlet and I were given some Country Bob's to review and we love it! It has a tiny bite to it which I love but Kidlet needs to have a little sour cream mixed in so it isn't too spicy for him. I find it to be very similar in taste to an HP sauce. It's soooo delicious. We dipped everything we could find in it and our 2 bottles are almost gone! Now guess what? 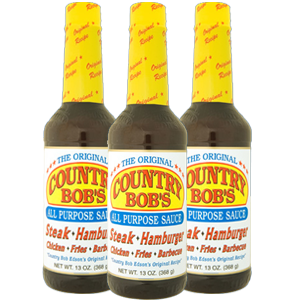 You can win some delicious Country Bob's All-Purpose Sauce! Two winners will be chosen to each receive 2 bottles of tasty saucy goodness. You are making my mouth water! I'd like to try it with baked chicken. I am a big 'dipper' when it comes to chicken! that looks yummy! now I'm craving dipping steak bites! Some nice grilled chicken!! YUM. I love Country Bob's on my hamburgers and I love dipping my fries in it. ~ Angie B.
I think I'd try popcorn chicken since I have some in the freezer. Chicken tenders, of course, lol! Corn flake crusted chicken tenders! 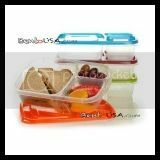 I use it with eggs.. and everything else !! I'd dip BBQ chicken in Country Bob's sauce! ooooh Chicken Fingers! Or some grilled steak! Yum! I would probably dip chicken nuggets or french fries in it first. I would just love to smother a big juicy cheeseburger in it. I would eat chicken strips!!! I would eat chicken strips!! I like to eat Country Bob's on steak! I have to have "Bob's sauce" for steak! imscotts _ love at yahoo dot com. I have really been wanting to make steak fingers lately and this would be perfect dipping sauce for it. Mmmmm-now im hungry. Deer sounds pretty good with Country Bob's! Might sound strange but celery! Definitely chicken breasts and likely steak also!! Will have it with hamburgers! I would use this on some chicken sounds yummy. I'd like to try it with chicken, steak & fries! i would put it on my burgers and also dip chicken strips in it! First thing I thought of was french fries....so that'll probably be first! I love this stuff, but I've never used it as a dip, I mix it in with our burgers, meatballs and such.. so good!!! Country Bob's Sauce is great on everything! I want to try it with chicken first. I had it with fries today! We'd be dipping roast beef into it! Chicken nuggets - Kris D.